Travel Tales of a technogeek. I managed to convince AB that Pandavgad isn't that far for a bike trek from Pune so he agreed to come along for this weekend. Unfortunately he called me up on Saturday night to tell me that he was unavailable. But I had company. Note that the company is an essential ingredient of a good trek. If there is lack of good rapport then it could be a torturing experience. Anyways so enough of this, we are here to go over the actual details. We started a bit late for reasons I wouldn't want to explain and you would be bored to read. 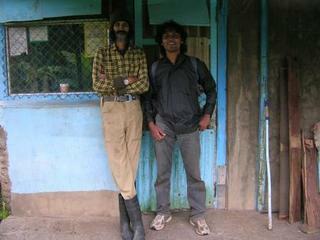 We reached the Nasarapur corner at about 7.35 am and had breakfast there. We took a right turn to Bhor, [12Kms from the turn]. 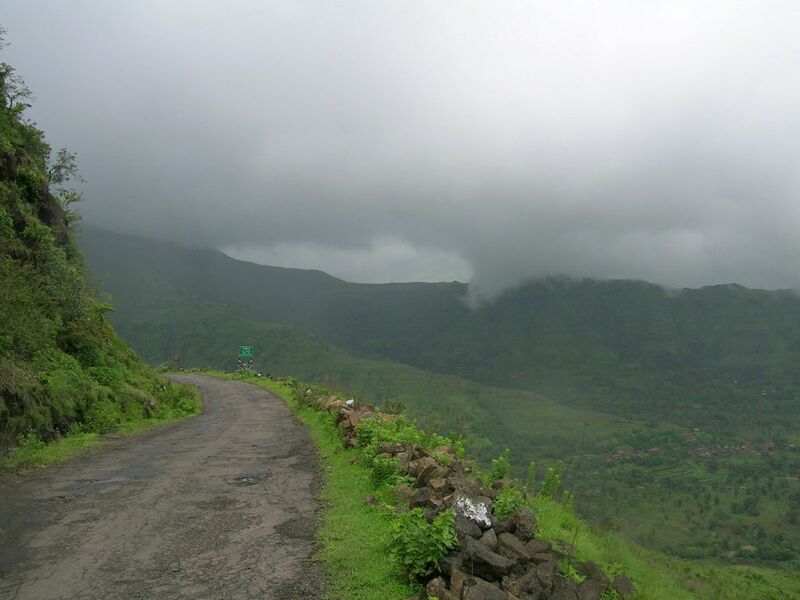 From Bhor you can take a left to Wai [ 35Kms from there] via Ambade ghat. So this road actually saves a lot of distance and the ghat is an interesting and scenic place. Although don't expect an expressway kind of road. It's like a typical monsoon Pune road at places. On top of this ghat is a place called Mandhardev which has a temple of Mandhardevi. Due to one pious individual with us, we took a turn to this place from ghats [3.5Kms from here]. This ghat separates Pune and Satara districts. The Wai taluka on one side and Bhor on other. Mandhardev is most of the times in clouds and attracts lot of pilgrims on Navratri. In February 2005 there was a stampede which claimed 300 lives. So anyways from the top of the ghat, the descend to Wai starts, this section is called as Mandhardev ghat. From here you can see the Dhom dam to right, town of Wai to the left and Pandavgad right ahead. 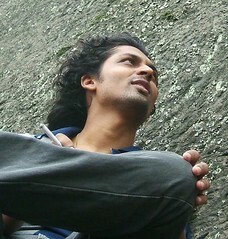 To reach Pandavgad one can either go to Wai and then reach Menavali and start climbing. Another route is as you are getting down Mandhardev just as the ghat ends, there is a place called Gundewadi, you can climb from here as well. We chose the second option and it is the best option. The climb from this side takes less time. From Menavali side you have to go round the fort and join the same road to top. Menavali and Wai have lot many interesting places to visit. Menavali was the home base of the famous Peshwa minister Nana Phadanavis. His residence [ wada ] there is worth a visit. 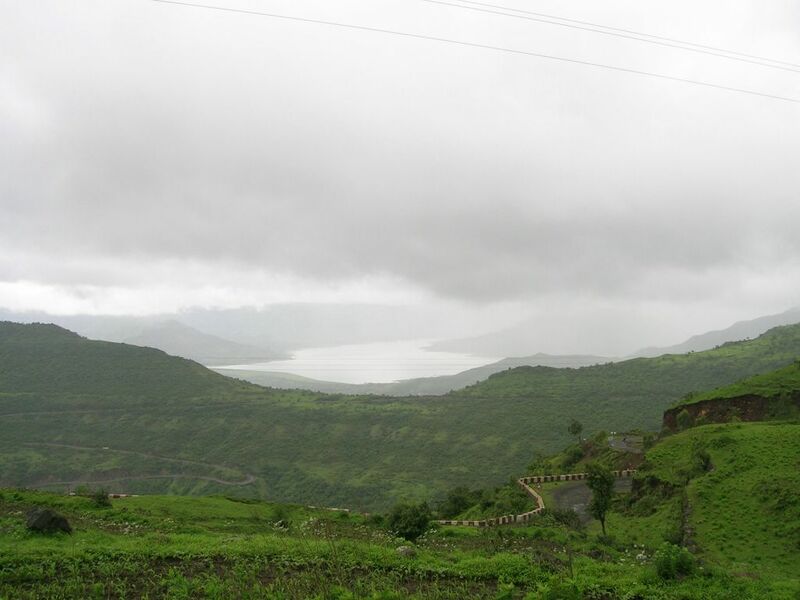 From the top you can see table land and Pachgani ahead. Wai to left, Dhom / Kamalgad / Kenjalgad to right. Words fail me to describe the view one gets from here. As we were returning one guy just popped out from somewhere. He said he was the watchman here and the landlord wanted to see us. So that was our encounter with Mr. Sher Wadia. This gentleman stays alone on this fort for past 22 years. There are lot of things we got to know from this gentleman. He bought the fort in an auction from Satara bank in 1983 for Rs. 40000. Now his friend owns it. Edit: Found some info about this chap here and here. Ajinkyatara / Pratapgad / Raigad and Pandavgad are all private properties owned by few royal families or auctioned like this one. He told us that Kamalgad in records called Kattalgad. Kamalgad was was used by the british to execute prisoners of war. He told us that he tracked the history of fort in documents but they were all in Modi [script] and he hired a guy to interpret that and all he could go back to was 1892. He talked about his encounters with tigers [ one with stripes] etc. Offered us some coffee. If one wants to stay overnight one would have to write to Mr Vora at Mapro and seek his permission. I have a lot to write here but then lengthy reads are boring. You can check out the pictures, they are not as cool as some of my earlier ones but enough to give you an idea. More pictures can be found here. We took a longer route from Wai in hope of a better road. My bike gave me some trouble on the way back. So had to change the engine oil [ my own diagnosis ]. It worked. My left knee is hurting for past two treks. I need to get it diagnosed. 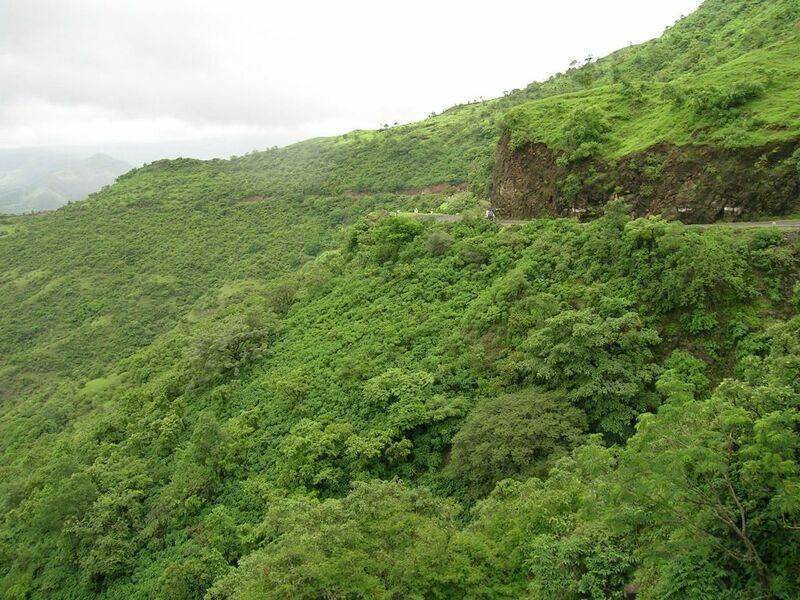 I lived in Panchgani till 1997. Now live in London. your pictures brought back loads of good memories. I have walked up all the mountains in the area and they are BEAUTIFUL. lovely photos. I also knew Sher wadia who was my Father's friend a long time ago. Brings such joy to my heart. Known Sher since I was a little girl. He is one of the most beautiful people I have ever known and only such beauty that he surrounds himself with, becomes him. Thanks Sher, thanks for being you. Joy...I was in Panchgani when Sher lived there, We wrote to one another for many years, but lost touch. Man I cant beleive that your such a good trekker.I myself am from panchgani and our group makes an annual trek to kamalghad and and camp out for a couple of days. Ill put up latest pics in some days adn i aill be taking my students on sunday. Many Thanks for your kind words Devendra. You have no idea how much I appreciate it. Cheers and all the best for your weekend venture.